What is 'fancy ketchup' and is it actually better than regular ketchup? There's a legal definition behind different types of ketchup. There are a lot of questions surrounding ketchup. After all, it's one of America's favorite condiments. For one, there's a big debate over how it should be spelled: ketchup or catsup? What exactly are the 57 varieties referenced by Heinz? And is there a trick for getting ketchup out of a stubborn glass bottle? The inquiries are endless. But if you happen to be paying close attention to different containers of ketchup, the most burning question might be, “What the heck is 'fancy' ketchup and is it actually better than regular ketchup?" According to the United States Department of Agriculture (USDA), there are three grades of ketchup: A (which is the highest grade and it's called "fancy"), B (or "extra standard"), and C ("standard"). Grades are assigned to different types of ketchup after four different factors are assessed: color, consistency, presence of defects and flavor (it's almost as fancy as grading diamonds!). Since 1992, the USDA has referred to this 21-page grading manual for classifying America's favorite condiment. In November, a woman in California wanted ketchup so badly that she attacked a McDonald's manager when her drive-thru meal didn't come with it. 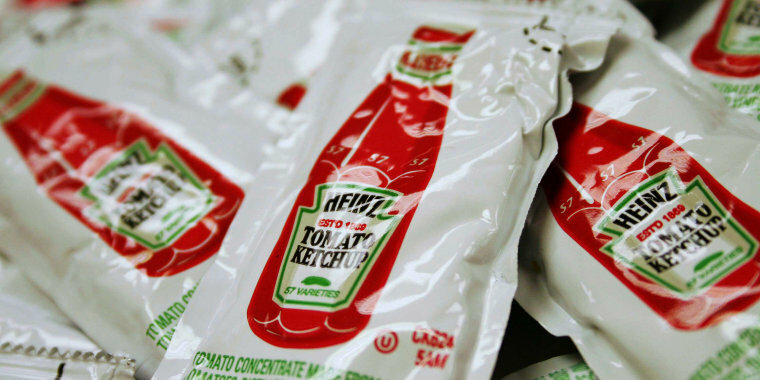 According to the USDA's guidelines, Grade A ketchup must possess a "good" color, consistency, flavor and finish — and be "practically free" of defects. Most importantly, it must contain at least 33 percent total solids. In other words, Grade A ketchup is less likely to slide off your hamburger than a Grade B or C ketchup, which can legally contain more additives and more liquid. However, even if your ketchup isn't specifically labeled as fancy that doesn't mean it's not Grade A.
Heinz, for example, meets the USDA’s standards for Grade A ketchup and is the ketchup supplier for major chains like Burger King, Sonic, Applebee's, Arby’s and Chick-fil-A, none of which brand their in-store condiment packets as "fancy." Heinz — which has been around since 1869 and recently introduced a divisive mayonnaise-ketchup hybrid called Mayochup — supplied McDonald's restaurants for four decades ... until a former Burger King executive became the CEO of Heinz. Today, McDonald's actually makes its own ketchup from these ingredients: tomato concentrate from red ripe tomatoes, distilled vinegar, high fructose corn syrup, corn syrup, water, salt and natural flavors. Each 10 gram packet has 10 calories, 2 grams of sugar, 2 grams of carbs and 90 milligrams of sodium. Burger King's ketchup also has 10 calories per packet. However, it contains 35 more milligrams of sodium per serving. Both are considered Grade A ketchups. Is Grade A ketchup healthier than Grade B or C? Not really. Store brand ketchups like Walmart's Great Value Ketchup, Kroger Original Ketchup and Safeway's Signature Kitchens Tomato Ketchup (which are often the cheapest ketchups available on store shelves) have a similar nutritional value to McDonald's fancy counterpart. For example, a 10-gram serving of Kroger's ketchup has around 12 calories, 2 grams of sugar, 3 grams of carbs and 94 milligrams of sodium. With its smoother look, taste and consistency, fancy ketchup is more likely to gain a cult-like following than other types of ketchup. Whataburger’s Fancy Ketchup (which was previously only available at its restaurant locations) is so popular that it’s now sold in 20-ounce bottles in grocery stores. The Texas-based hamburger chain also sells a Fancy Ketchup Lover’s Bundle, which features a reusable shopping bag, a T-shirt and a mousepad that all list the components of its signature sauce. Of course, if fancy ketchup isn't fancy enough for you, you can always make your own ketchup at home.